Tasmania is absolutely worth the journey. Join us to row some of the best waters in Australia and experience a stunning landscape, vibrant culture and superb cuisine. The climate of Tasmania is more temperate than the rest of Australia, which means the landscape is green, beautiful and wild. About 40% of the state is protected land, whether as national parks, reserves or other. Mountains rise above alpine lakes, dazzling white beaches dot the coastline and vibrant communities reflect a fascinating history. All this on a compact island. 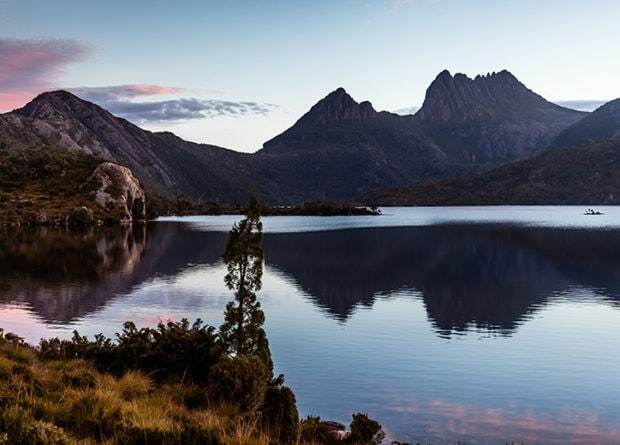 We will travel by vehicle, exploring some of the best that Tasmania has to offer, rowing and otherwise. It will be a grand adventure. We love the format of this trip, since it shows off highlights of Tasmania and also includes a fantastic diversity of rows. Five different clubs will welcome us to row on beautiful lakes and gorgeous rivers. We are especially excited about a two day mini-tour on the Tamar River – Lonely Planet calls the Tamar Valley “picture postcard perfect”. That just about sums up Tasmania. All that rowing builds up a good appetite. If you want to eat fresh and local, this is the place to come – they claim that the culinary experience is the envy of chefs around the world. The cool climate produces superb pinot noir and riesling wines, and the beer and coffee are not so bad either! Tasmania is a very interesting place. Some call Tassie quirky. The tagline for Tourism Tasmania is “a curious island at the edge of the world”. We just love the island vibe, the distinctiveness of Tasmania. From the crazy idea of a penal colony on one of the world’s most beautiful islands, has evolved a friendly and fascinating destination. It is a bit apart, but not. You really have to come and see for yourself. How can you not like a place that has a town called Nowhere Else? Curious? You don’t want to miss this trip. Want more Australia? Join us for our Clarence River Charm tour. Other tours will be announced – be sure to be on our newsletter list to get those details when they are ready. Non-rowing companions welcomed. Contact us for details. Note that this is the first time this trip will be run, so it is somewhat experimental in nature. Plans could change. In particular, some of the rivers are tidal, which will determine the exact time of the rows. Wind conditions will also be an important consideration – safety is a priority. Thus, on some days, the actual program may vary from this description. We recommended that you book a few extra days in Hobart in advance of the trip start. It is a terrific city with lots to see and do. Salamanca Market on Saturday is considered one of the top sights of Tasmania. Welcome to Tasmania and Hobart and our rowing trip. We will discuss the plans for the next week over a wonderful dinner, as we enjoy our first taste of the excellent food and beverages of Tasmania. Our first row showcases Hobart. 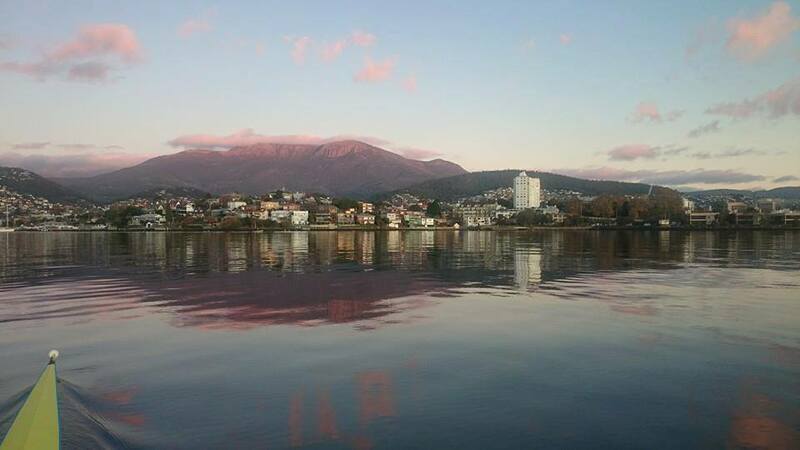 From Sandy Bay we will row north on the Derwent through the harbour to see the city from the best view – on the water. In the afternoon off we head to MONA, the world class Museum of Old and New Art. Sometimes challenging and controversial, the works are the collection of one man, eccentrically presented in a stunning building built into the hillside of the Moorilla Estates north of the city. We’ll meet up with some local rowers for drinks, snacks and rowing stories! Dinner on your own tonight. 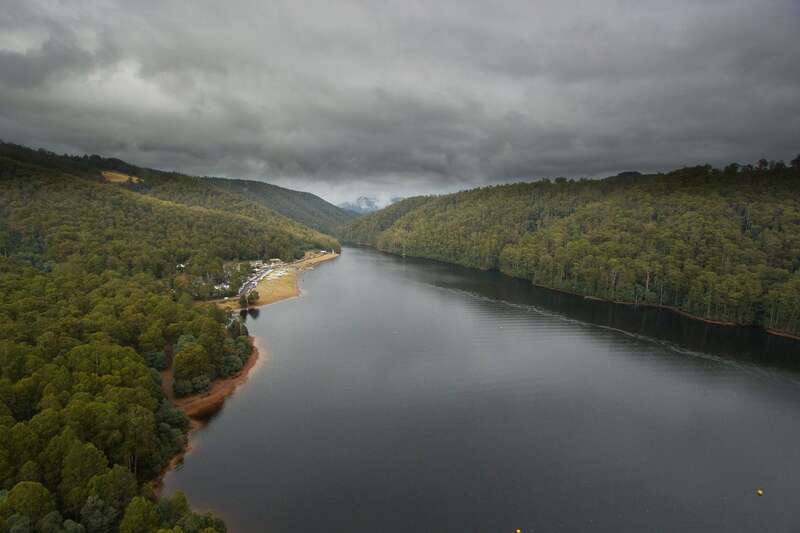 The Huon River is simply spectacular, considered one of the best places to row in Australia. A short drive south of Hobart brings us to Franklin. Perhaps we will circumnavigate one of the Egg Islands, with reeds and apple orchards lining the banks. We might be accompanied by a few St. Ayles Skiffs, fixed seat boats, and have a chance to take them for a spin. 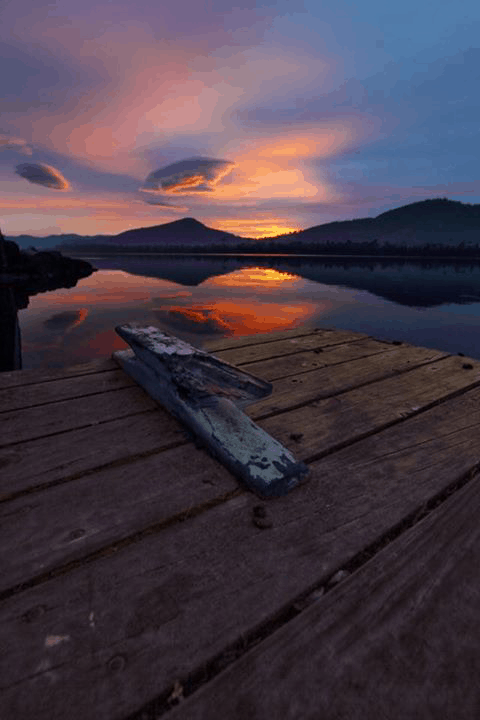 An essential visit will be to the Wooden Boat Centre at Franklin, which is Australia’s only wooden boat building school, with a display open to the public. We will do a little touring along the coastline on our way back to Hobart for another fine evening meal. The intimate upper reaches of the Derwent contrast with the broad wide estuary in Hobart. Rolling countryside surround a narrow river lined with trees, where black swans swim and preen. In the morning we will say good bye to Hobart and head north, stopping at New Norfolk for a delightful row. Then we follow the Heritage Highway, built by convicts in the early 1800s. Many of the towns along the route reflect the colonial heritage of this period. For example, Ross Bridge built in 1836 features 186 different carvings of flora, fauna and local personages. Our destination is Lake Barrington, an international rowing centre in the heart of the island. Lake Barrington, nestled amongst green hills, is 25 km long, giving us ample scope for an excellent morning row. In the afternoon the boats will go back to their home in Ulverstone, while we head to Cradle Mountain – Lake St. Clair National Park. 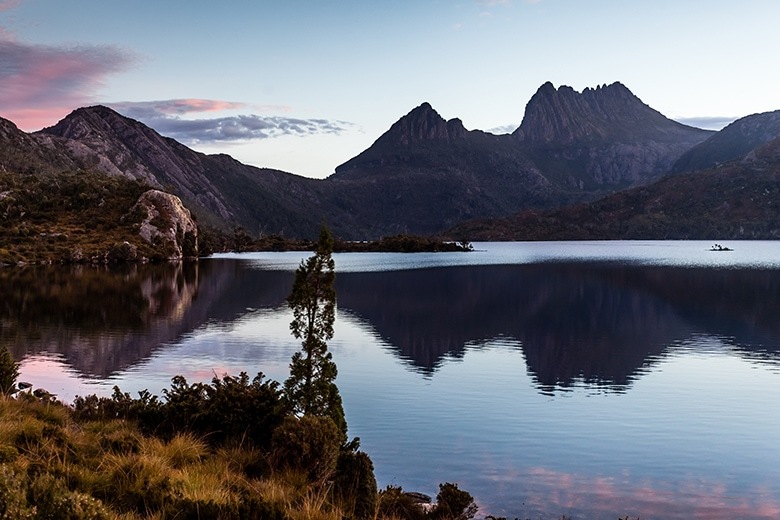 A walk around Dove Lake is on the agenda, along with the chance to meet some Tasmanian Devils – the furry four-footed ones that is. Then back to our country accommodation near Lake Barrington. In the morning we drive to Ulverstone where we meet our friends and boats from yesterday. This time we row their home waters of the Leven. Lovely landscape and lots of bird life – we will keep our eye out for the local Sea Eagle that often shows up for rowers. As always the rowing is followed by a tasting lunch, before we drive on to Launceston. We have an afternoon appointment at North Esk Rowing Club to prepare our next boats for our Tamar River mini-tour. And enjoy a drink in the Members Bar of the new clubhouse before we check into our hotel. Dinner on your own tonight. To catch the rising tide that will carry us along the Tamar, we will leave Launceston early in the morning and drive to Lagoon Beach at Low Head. This is the mouth of the Tamar, where it empties into Bass Strait, which separates Tasmania from the mainland. Our morning row passes Georgetown and enters the vineyard clad hills of the Tamar Valley, the island’s premier wine producing area. We will pass under the elegant Batman Bridge to arrive at Paper Beach at Swan Point. A well-earned lunch before we head for a relaxing afternoon at our hotel in the vineyard country. The tide gives us a pleasantly late start to the morning. From Paper Beach we row all the way back to the club house in Launceston. Once we put the boats away, upstairs we go to enjoy food and drinks with our friends from North Esk Rowing Club. This afternoon we want to have a bit of time to explore Launceston, Tasmania’s second largest city, best known for Cataract Gorge as well as its charming Victorian buildings. Our final farewell dinner is tonight. It is time to leave, but with lots of wonderful memories of rowing and touring Tasmania. Options include flights from Launceston Airport, or a transfer back to Hobart.